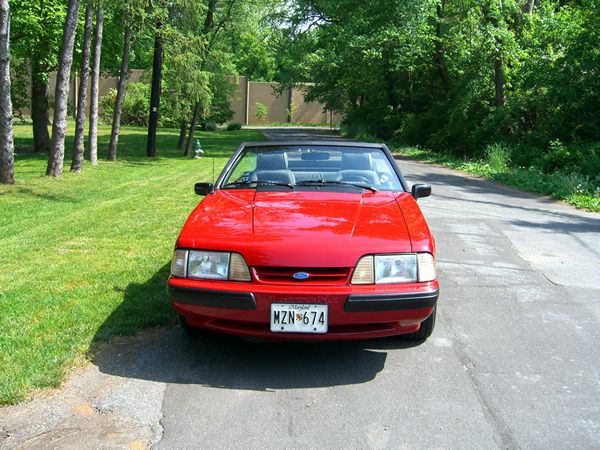 My 1989 Mustang 5.0 LX has been sold! Note: I still have a Britax Husky child car seat and a Britax Laptop child seat suitable for cars lacking rear shoulder belts such as the Mustang. I'd like to sell them. See the child seat notes at the bottom of this page for more information. 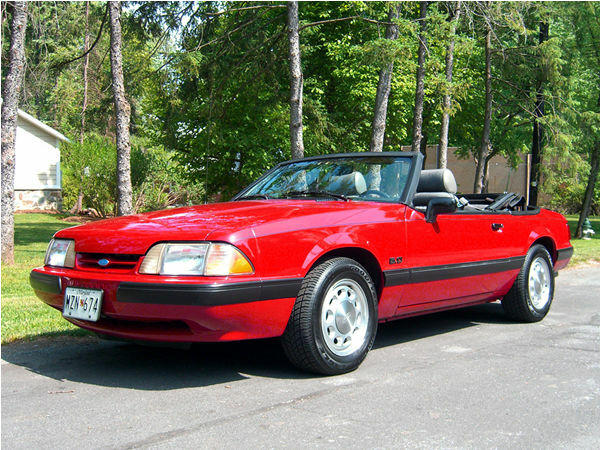 I bought the Mustang in September 2004 from a woman (actually a grandmother) who purchased it new in 1989. 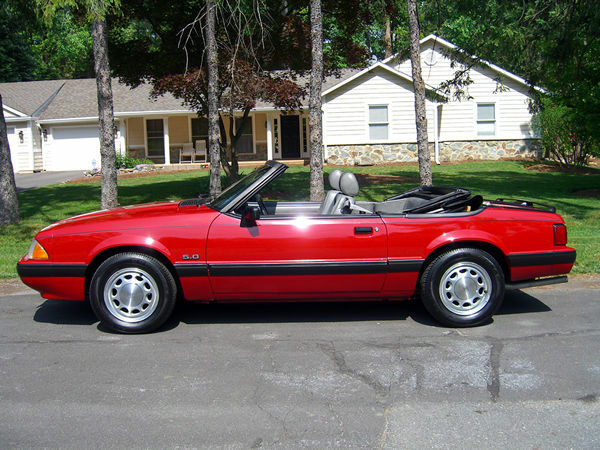 The body was in great shape and the car had been recently repainted courtesy of the previous owner. I put about $4000 into into the car. 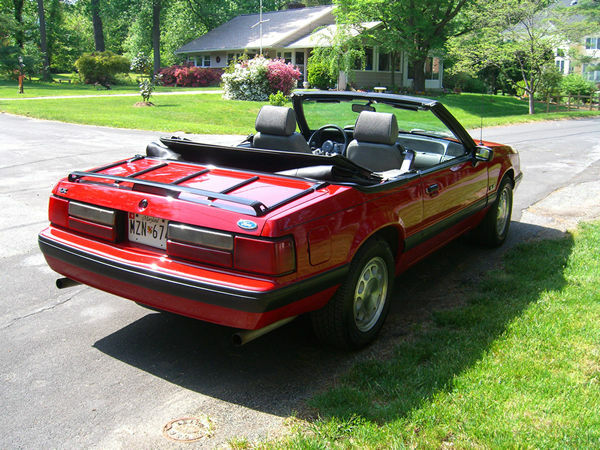 I replaced virtually all of the A/C, tuned and cleaned up the engine, repaired the convertible top, had brake work done and fixed other sundry things like a broken door handle. All mechanical work was done by my favorite local shop. The seller was nice enough and an adherent of a religion that promotes love and forgiveness. That didn't stop her from concealing the fact that it stalled at every 20th red light. I put considerable effort and expense to fix the problem. 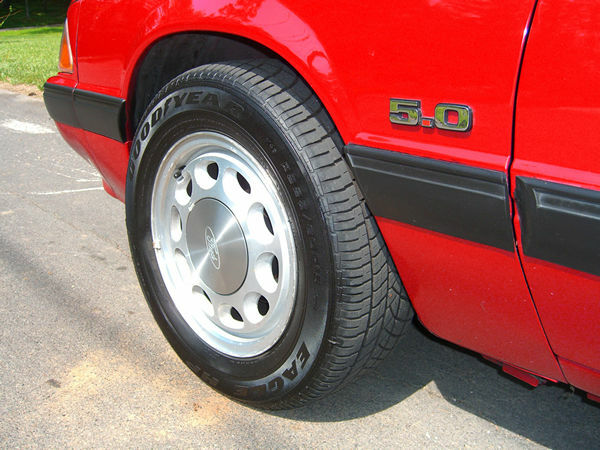 Whenever I sell a car to an individual purchaser, I believe it's my responsibility to divulge any known, unrepaired problems to prospective buyers. 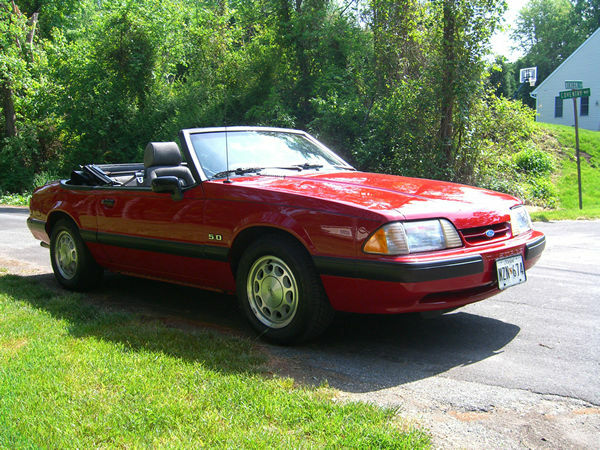 Options: 5.0 liter V8 engine, air conditioning, auto transmission, power doors, power windows, power top, cruise control, rear glass window, gray cloth interior, premium sound FM stereo with casette player. 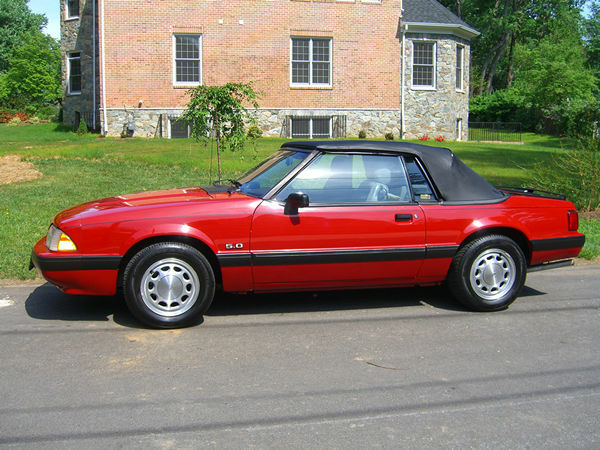 I installed two unusual child seats in the back of the Mustang for my two children, aged 4 and 6 when I bought it. 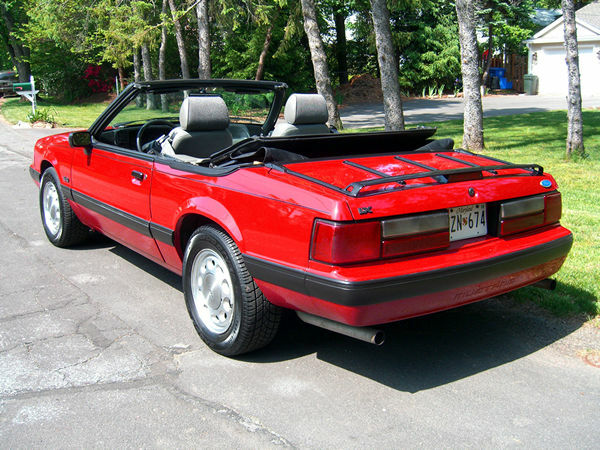 Pre-1990 Mustangs have no rear shoulder belts, just lap belts, so conventional booster seats don't work. 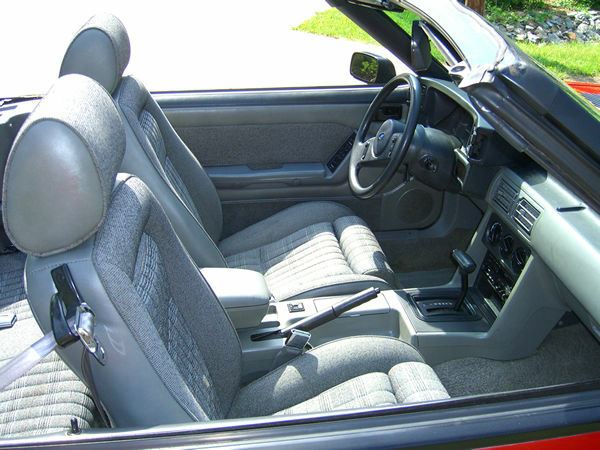 Old "shield" style seats are very dangerous, and strapping your child in with just a lap belt is neither legal nor safe. 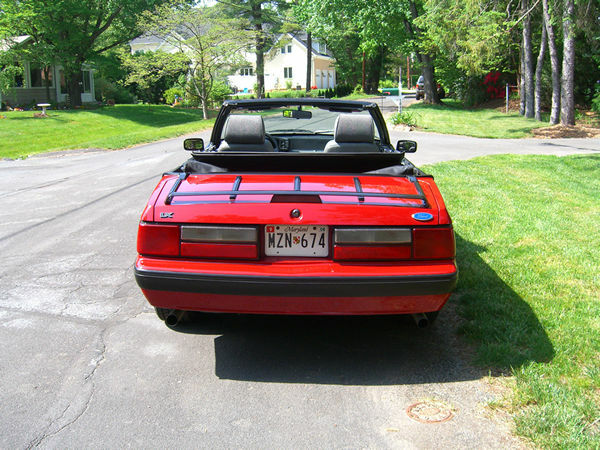 No one makes a retrofit shoulder belt kit for the 1989 convertible to address this problem. So I purchased the two special seats. One is the nifty Britax Laptop, which I purchased on eBay for a rather large sum (it's discontinued). 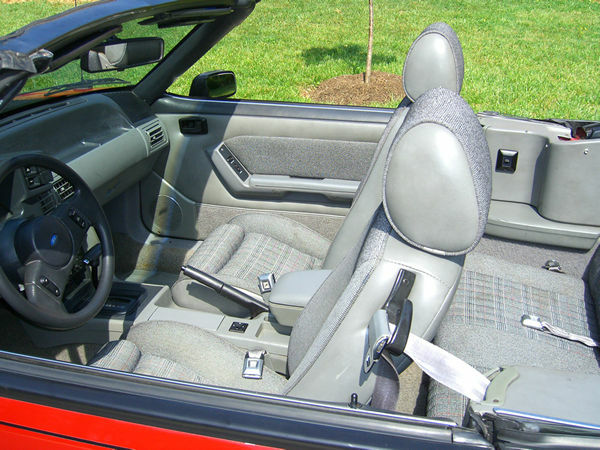 The price I had to pay shows that there's an unmet need for booster seats that work with older cars. The Laptop works for kids up to 65 pounds. 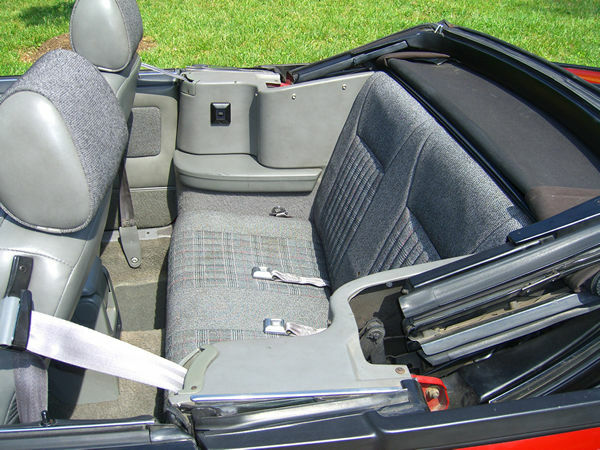 The other car seat was a Britax Husky, a sort of giant infant seat for kids up to 80 pounds. I prefer the Laptop because it keeps the child low in the seat (it fits over the child, not under). Note that two Husky seats can't fit side by side in a Mustang convertible, but the Laptop fits next to the Husky. Unfortunatley the rear seat passengers have little protection against cigarette butts and anything thrown out of someone else's window on the highwy. So I kept the top up when driving on fast roads with the kids. But in fact I didn't drive with the kids in the car too often.